The family Hesperiidae is also referred to by their collective English Common name of "Skippers". Most of the species appear moth-like with big eyes, fat bodies and usually drab colours. 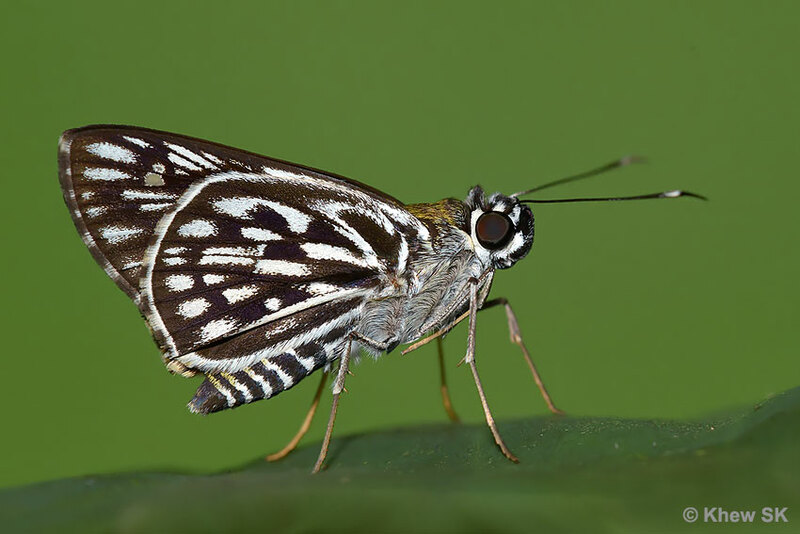 There are a few species in Singapore where Skippers are attractively patterned like this one, the Chequered Lancer. 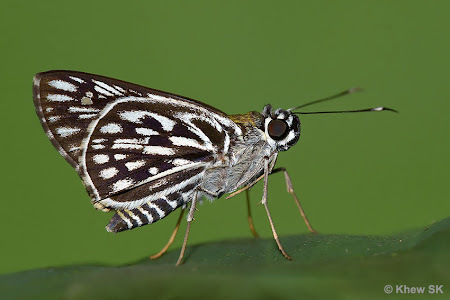 The undersides of the wings feature a chequered black-and-white pattern. It is usually found in shaded forests where its caterpillar host plants - mainly various types of palms grow. In Singapore, it has been successfully bred on Fishtail Palm and the documentation of the early stages can be found here. The Chequered Lancer lurks in the shaded understory of tall trees, and usually rests with its wings folded upright. Its scientific name "naga" refers to a dragon or a serpent in Asian folklore. It would be interesting to know what inspired the entomologist, Lionel de Niceville to christen the species naga in 1884 when he discovered and described it. De Niceville did a lot of his work in India and hence his reference to naga would have been in the context of the serpent in Indian culture.